After attending the Career Management Office's networking events, MBA students landed internships that turned into full-time, post-graduate positions. Making “the connection” is a critical sign of success for Weatherhead’s Career Management Office (CMO). Once a year, the CMO team does just that during its Meet Our MBAs networking event where employers, both regional and national, connect with Weatherhead MBA students. Students leave the event with interviews for internships, job opportunities and, sometimes, the pathway to their next big career move. Such was the case for MBA students Ben Forman and Brian Tighe– both landed internships through their Meet Our MBAs connections and will soon be moving into full-time positions. Forman, who attended the event in spring of 2017 will graduate this spring and join Lubrizol, a $6.5 billion specialty chemicals company headquartered 18 miles east of Weatherhead as a full-time employee. The process began when Forman connected with a recruiter from Lubrizol at the Meet Our MBAs event, where they discussed an upcoming summer internship. Forman admits he knew very little about Lubrizol initially, but became interested when he heard about the company’s marketing innovation internship. Forman ultimately landed the role, which secured him as a candidate for a full-time position after graduation. “They evaluated us throughout the course of the summer, which culminated in end-of-summer presentations to senior management. They were intimidating but also pretty fun,” he says. “It’s cool to get to sit down with the head of a $3 billion company—and that’s just the advanced materials side.” Forman made his presentation, which was followed by closing interviews with the recruiter. After some deliberation, the company made offers to five out of the eight summer interns. “We all accepted,” says Forman. Tighe was also among those five interns offered a position and will join Forman at Lubrizol after graduation. Tighe used the Meet Our MBAs event as an opportunity to reconnect with Lubrizol, as his first touchpoint was with the company’s HR manager who happened to attend a prospective students event at Weatherhead where Tighe was an ambassador. “I’m a firm believer that any networking event can lend itself to opportunity,” says Tighe. “Case in point, with me and Lubrizol. You just have to show up.” At the Meet Our MBAs event, Tighe spoke with more representatives of the company and used the opportunity for another face-to-face interaction before launching into the interview process for a summer internship. 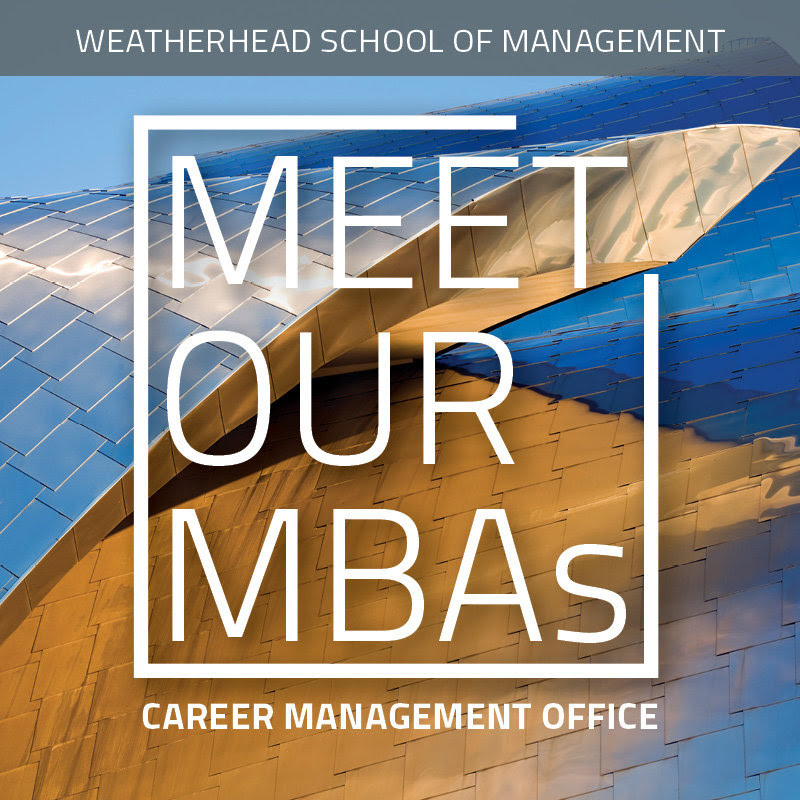 The Career Management Office provides resources to all Weatherhead students in all degree programs. To learn how you or your organization can recruit Weatherhead talent for internships or full time positions, please contact Maggie Smith, Associate Director of Career & Employer Development, or Meenakshi Sharma, Associate Dean for Career & Student Affairs.